One of the major milestones for Exploration Mission -1 (EM-1) was completed on Monday with the arrival of Orion’s Pressure Vessel at the launch site. The capsule hardware was constructed at the Michoud Assembly Facility (MAF) in New Orleans ahead of a trip on a NASA Super Guppy aircraft to the Shuttle Landing Facility (SLF). EM-1’s Orion is following a similar path to that enjoyed by the Exploration Flight Test -1 (EFT-1) Orion, where the bare bones of the spacecraft were constructed at the former home of the Shuttle External Tank production, ahead of months of outfitting work at KSC. Work to construct the hardware officially began in September of last year, although processing information cited May 1 was the initial target for the historic milestone for the EM-1 Crew Module shell “first weld”. A large amount of pathfinder work also took place earlier in the year. Despite the short slip to the start date for welding operations, the construction appears to have benefitted from the EFT-1 and Pathfinder paths, with two sections of the Orion spacecraft’s primary structure were welded together on September 5, prior to the joining of all seven large aluminum pieces – via the friction weld process – without any further delays. “The team at Michoud has worked incredibly hard produce a lightweight, yet incredibly durable Orion structure ready for its mission thousands of miles beyond the moon,” noted Mark Kirasich, Orion program manager. 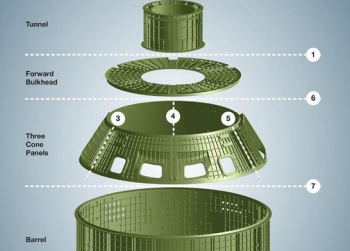 The Orion pressure vessel is a key element for the spacecraft as it provides a sealed environment for astronaut life support in future human-rated crew modules. With its processing at MAF complete, it was then packed inside a protective container and loaded onboard NASA’s Super Guppy aircraft. On Monday, the unique-looking aircraft touched down on KSC’s famous Shuttle Landing Facility. Engineers will unload it into a fixture in the Armstrong Operations & Checkout (O&C) Building where it will undergo testing on its subsystems. Those tests will ensure the structure is sound before being integrated with other elements of the spacecraft. It will then begin a long process of outfitting – following the path of EFT-1’s preparations for launch – with additional elements of the spacecraft set to arrive at KSC over the coming months. 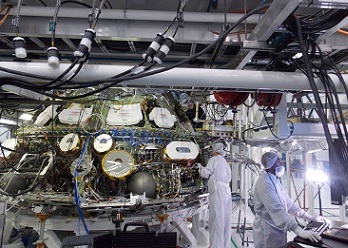 The outfitting work – which was scheduled for a run of 17 months for EFT-1 – will involve a lengthy process ranging from the addition of secondary structures, through to the wiring that will allow Orion to come to life. That latter milestone will be marked by the first power up of the EM-1 Orion inside the O&C Building and the checkout of the spacecraft’s avionics. Once Orion has completed its O&C processing path, it will be transported out of the building to be mated atop the Space Launch System (SLS) inside the Vehicle Assembly Building (VAB) for what is currently a mid-2018 test flight. 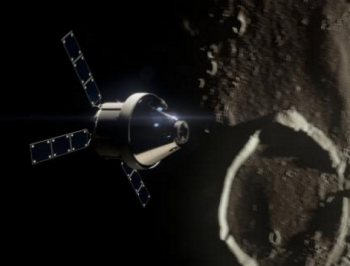 EM-1 involves an unmanned mission that will send Orion 70,000 kilometers past the Moon. It will allow for a major test of the Space Launch System (SLS) rocket – although the Delta Cryogenic Second Stage (DCSS) will be immediately changed to the Exploration Upper Stage (EUS) following this initial mission. 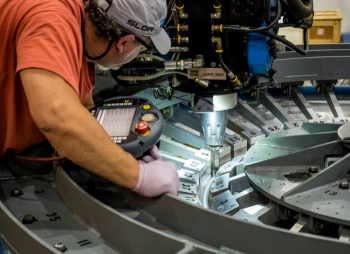 Orion will also sport the European Service Module (ESM), with a structural test version of the hardware currently onsite at the Space Power Facility (SPF) at NASA Glenn for testing. 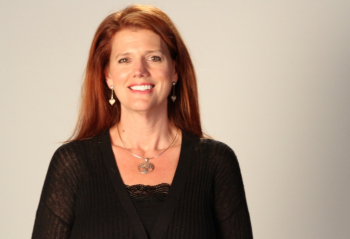 The historic debut launch of SLS and Orion will be led by veteran spaceflight engineer Charlie Blackwell-Thompson, following her selection this week as the launch director for EM-1. The selection of the former Space Shuttle firing room controller also makes her the first woman to oversee a NASA liftoff and launch team. “I remember when I walked into Firing Room 1 during a tour before I was hired many years ago, and one of the guys said if you take this job you will sit here at this console,” Ms. Blackwell-Thompson noted. “I was amazed at even being in the firing room, and the thought of being on the launch team then was unbelievable.